Proper Use of the PDT100,PDT110,and PDT120/PDT122 Neutron Pulse Monitoring Modules - 100A,110A,120A compact neutron monitoring modules designed for high radiation environments connect directly to neutron counters allowing quickly and easy interconnection from 1 to over 100 detectors for digital pulse counting measurements. This new generation of neutron monitoring modules allow new systems to be quickly configured and existing detector instruments to be easily upgraded. The charge sensitive amplifiers are designed for Helium-3,boron loaded, fission chamber, alpha and proton-recoil neutron detector operation. Multiple modules can be easily interconnected providing a single digital counting channel that will process pulse rates exceeding 5 MHz. Engineered in a compact ruggedized aluminum housing that interfaces directly to gas filled detectors, these modules provide an efficient clean solution in difficult environments. Series 100A,110A and 120A modules provide customers with considerable versatility. This application notes provides users with a basic understanding in the proper using of the 100A ,110A ,120A and 122A instrument. 100A Series Bias Supply - The 100 series modules provide an equivalent feature set to the 110A modules but additionally contains an adjustable high voltage bias supply settable from 0 Volts to 2200 Volts. All modules are configured at the factory for power supply (+Vcc) setting of either +5 volt operation (default) or +12 volt operation. High Voltage Bias Supply: 0 Volt to 2200 Volt Adjustment Span - The 100A produces high voltages and safety precautions should always be administered when using these instruments. Before applying power, make sure all cables are properly attached and modules are properly fastened to detectors. Do not apply power until modules are properly configured in your application ensuring that the power supply and all cables and detectors are properly connected to earth ground. The internal bias voltage (high voltage generator) of each 100A series module channels its HV output to two connectors, the "HV OUT " SHV connector located on the top of the module and to the HV PIN ((with suitable filtering applied) located at the bottom of the module which attaches to the detector. The HV PIN interfaces to the gas filled detector and is not available to the operator once connected to a detector. Having the bias supply available at the SHV connector allows customers to use the 100A as the biasing of the 110A,120A,122A series modules, or other applications that might additionally require a HV bias supply. For low count rates, a 100A module can support several 110A modules (4-8).For high count rates (>50K counts/sec), a 100A module supports three 110A modules. 100A series modules are available in three basic configurations,100A (standard),100F (Fixed Voltage), and 100R (Remote control). The 100A is the standard configuration containing an internal twelve turn variable resistor (trim pot) allowing the user control of the high voltage bias supply over a range of 0 to 2200 volts by simply changing the setting on the trim pot. The 100F is nearly equivalent to the 100A,however the trim pot adjustment span is +/- 100 volts about a preset fixed voltage set at the factory. The fixed voltage is determined by the user and units can be shipped with any preset voltage setting between 100-2100 volts. The advantage of the 100F is improved noise, temperature and mechanical vibration performance. Since the adjustment range is +/-100 volts, setting the voltage to .1 volt resolution (i.e..1700.1 Volt!) is easily achievable. 100A and 100F Modules - Both 100A and 100F modules provide access to a internal trim pot via a hole labeled "HV ADJ " located on top of the module. A test point labeled "HV MON " allows users to monitor the high voltage setting as the trim pot is adjusted. When adjusting a 100A module, as the trim pot is adjusted from its lowest level to its highest level (turning the trim pot clockwise using an adjustment tool) a voltage at the "HV MON " test point is observed that spans from 0 to 2.2 volts resulting in a voltage at the "HV OUT "SHV connector spanning 0 to 2200 volts. The same approach is used for the 100F although the voltage adjustment span is greatly limited (+/-100 volts). All 100A units are shipped from the factory with an "HV OUT " setting of 1700 volts which corresponds to a voltage of 1.7 volts at the "HV MON " test point. When monitoring the "HV MON " test point with your DMM meter it is best to connect the LO (or ground) of your meter to the 100 module ground itself (via one of the connector cases) rather than at the power supply source ground. This avoids additional errors resulting from ground current returns. Connecting the meter LO to one of the connector grounds is best achieved using a alligator clip since a ground test point is not provided on the module itself. 100R Modules - The 100R provides remote operation, allowing the user to control the high voltage by applying a precision DC voltage from 0 to 2.2 volts to produce an high voltage output of 0 to 2200 volts. The 100R is shipped with an permanently attached cable (for the remote operation) terminated to a BNC. To control the bias supply voltage, apply a precision DC voltage to the BNC. Be aware that the HV generator of the 100 series is engineered for low noise and excellent long term stability operation. When using the 100R,best performance can only be achieved with use of a low noise and highly stable precision DC voltage. It is best to use a DC source that provide 50 part per million (50 PPM) stability performance and the noise performance should be in the 10 PPM region. Generally, power supply sources will not provide suitable results. For safety, if the remote cable is not attached to a source, the 100R is designed to produce a low voltage (near zero volts) at "HV OUT ".The input resistance of the remote cable is 10K ohms, high enough that loading of your DC source should not affect performance. The input resistance of the cable alternatively provides suitable protection if you happen to connect the remote cable to a voltage greater than the power supply voltage (+Vcc). The 100R will not be damaged for voltages up to 20 volts applied to the remote cable. In your application, after the cables and detector(s) have been properly attached to the 100A series modules, apply power to the module. Monitor the "HV MON " test point and adjust either the internal trim pot or the remote DC voltage to obtain the desired "HV OUT " voltage. Use a 5-1/2 digit voltmeter to obtain good monitoring information and allow you to simultaneously monitor noise and stability performance. Basic Neutron Pulse Counting - The 100A,110A and 120A series of products provide accurate neutron pulse counting in a compact user friendly package. A 50nsec digital pulse from the connector labeled "TTL OUT " is produced each time a bipolar pulse (neutron event) exceeds the discriminator threshold. The 50nsec adjustable digital pulse (adjustability available only on the 110A and 120A modules) is achieved via a variable resistor located beneath a hole labeled "PW " on top of each module. A light-emitting-diode (LED) emits a flash, providing visual indications of detected pulses exceeding the discriminator setting. Control of sensitivity or threshold occurs via a 12 turn trim pot located beneath the hole identified as "THRES ADJ " on top of the module. Pulse Observation - 100A,110A and 120A modules contain analog pre-amplification and bipolar amplifier electronics for pulse generation of detector charge events. The amplifier produces a 0 to 1 volt bipolar pulse which is feed to the "PULSE MON " test point. The output impedance of the "PULSE MON " test point is 10K ohms providing effective monitoring using an oscilloscope and impedance loading of the test point will not affect the performance of the amplifier. Amplifier gain is set with the "THRES ADJ " trim pot as identified above. Using an oscilloscope, observe the bipolar amplifier pulse at the "PULSE MON " test point. To simplify the monitoring of the analog pulse, apply the "TTL OUT " digital pulse to the external trigger of the oscilloscope. Remember that each time a pulse is detected by the discriminator, the LED flashes. The LED provides a good troubleshooting aid when monitoring neutron events. With the "TTL OUT " connected to the external trigger of the oscilloscope, cable the "TTL OUT " to the input of a counter and begin counting pulses. Using the 100A module, you can easily increase and decrease the HV supply observing the change in the gain of the amplifier pulses. Use the HV bias as the amplifier course gain adjust and use the "THRES ADJ " trim pot as the amplifier fine gain adjust. Determining the Proper HV Setting: Obtaining a Good HV Plateau Curve - Use a HV plateau to determine the proper HV setting for a Helum-3 neutron counter. To generate a plateau curve, collect a set of scalar counts ("TTL OUT " pulses) at fixed time intervals at a series of voltage steps. Plot the counts versus HV steps producing a plateau curve. The HV region above the knee of the plateau curve is generally where the detector is operated. Refer to the voltage setting recommended by the detector manufacturer. Digital Pulse Routing: Digital Summing - 100A,110A,and 120A modules can be daisy-chained by connecting the "TTL OUT " pulses from one modules to the "TTL IN " inputs of another module. This connection sums the digital pulses in an OR ’ed fashion allowing several modules to be daisy-chained, providing a single pulse counting channel. A module interconnection kit (CKB) provides cables and connectors for daisy-chaining modules. The "TTL OUT " Pulse - The "TTL OUT " uses a 50 ohm source and has been tested with good results using cable lengths in excess of 100 meters. The pulse width is preset at the factory to 50nS.However,on the 110A,and 120A modules, the pulse width can be varied from 40nSec to 500nsec by changing the setting of the trim pot located beneath the hole labeled "PW ADJ " on the top of the modules. 120A/122A Modules: Analog and Digital Summing - The 120A performs the same functions as a 110A or 100A modules related to neutron monitoring but is designed to operate with the 122A support module, a charge collection module.122A modules are easy to setup and operate. Charge events are collected by the 122 module and routed to the 120A module for amplification via the connector labeled "DETECTOR PULSE ".Each 120 module can support input from two to four 122A modules. This interconnection scheme reduces cost, simplifies cabling, allowing a series of detectors to be operated as a single 120A unit.122A modules have no adjustments, do not require a +Vcc (DC power supply) input, and provide the lowest cost solution, requiring only "HV IN " and "DETECTOR PULSE " connections. Note that each 122A module contains two "DETECTOR PULSE " connectors allowing 122A modules to be daisy--chained in a analog fashion. Such a scheme allows both analog and digital pulse summing. The 122A support module channels the analog pulse from the detector to the 120A via a cable that connects to the "DETECTOR PULSE ".Digital summing can occur simultaneously by summing the "TTL OUT " to the "TTL IN " between 120A modules as described above in the Digital Pulse Routing section. Typically, two to three 122A modules would be used for each 120 module. Factory Options - Due to the wide variety of applications,100A,110A,and 120A modules are customized to a wide variety of needs. Some of the customized applications provided to our customers are state below. These modules provide enormous versatility, and can be customized to your application needs. 100A,110A,120A and 122A modules can be ordered from the factory to interface to gas filled detectors using HN connectors, SHV, or MHV connectors or direct cables. Customized modules have been designed for extremely high radiation environments in excess of 100Mrad. Settline time: 0-2000 volts: .5 seconds. 2000-0 volts: 30 seconds. 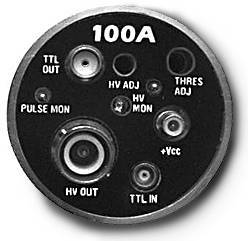 PDT100A modules have three input connectors: Detector Pin, "TTL IN," and "+Vcc." Connector Location: Located at bottom of module and connects directly to HN type connectors. Model PDT100A has a nominal threshold referred to the input of .02pCoulombs. For increased sensitivity, contact the factory for desired specifications. For monitoring low level events, the threshold can be increased five-fold through a special order from the factory. Threshold Control: Control variability is 20:1 using a 12-turn trimpot located beneath the hole labeled "THRES ADJ" on the module top. Stability: +/-5% of 25 degree Centigrade, 0 to 50 degrees Centigrade. Input Name: "TTL IN" as indicated on the top decal. Connector Type: Micro-coax female receptacle (miniature snap-on type). TTL signals applied to this input are logically OR'ed with the signal that is measured at the detector pin. If no signal is applied (the input is left open), no summing action occurs. Connecting +5V to this input will inhibit pulses from the "TTL OUT" connector. Input Name: "+Vcc " as indicated on the top decal. Connector Type: SMB female receptacle (snap-on type). Signal Characteristics: Power input for the PDT100A accept +5 volts (+4.75 to 6.0 volts) only. Supply Current: Typically 150mA for zero count rates, and for count rates in excess of 100,000 measured by the detector pin, the supply current is typically 160mA. Output Name: "TTL OUT" as indicated on the top decal. Connector Type: SMA female receptacle (screw-on type). TTL output matched to 50 ohm characteristic impedance which has been designed to drive coax cables of long lengths, in excess of 100 meters. If driving long cables is not an issue, the standard TTL out driver can be ordered, which will reduce the power requirements. The "TTL OUT" signal either connects directly to a coincidence counter or can be connected to the "TTL IN" of another PDT100A module for cascaded operation. Pulse Resolution: Pulse pair resolution is 500nS. Amplifier Count Rate: Maximum recommended count rate for accurate resolution should not exceed 1M counts.